EA Beauty is our newest form of consultation, created to help educate our clients and deliver naturally beautiful results that help them feel and look their best at any age. Whether you are new to EA or have been a long time valued VIP client, we are excited to invite you to try our EA Beauty consultation. By combining the science of PHI or the Golden Ratio with the desired results, the outcome can be predictably natural and beautiful. The Golden Ratio is found extensively within all things in art and nature that we consider beautiful. 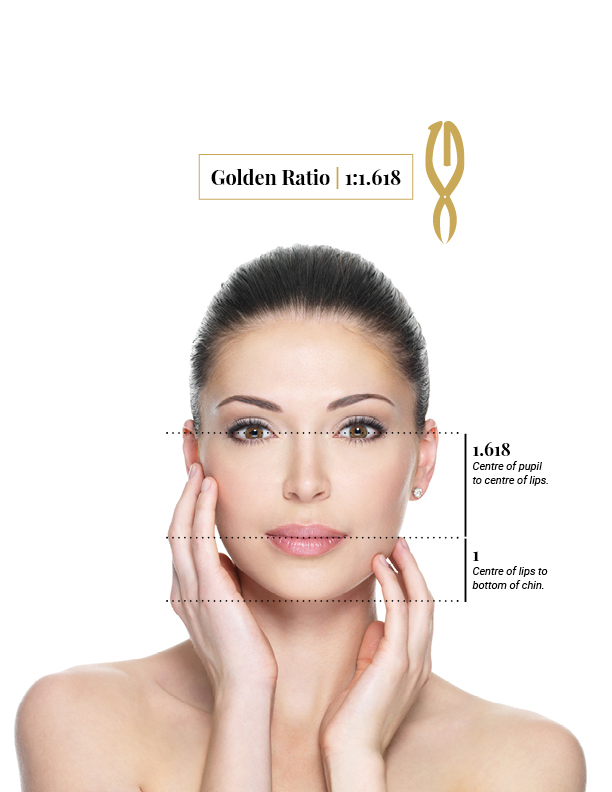 To the Greek mentality, the Golden Ratio was an attribute of beauty. Both ancients and moderns believed that there is a close association in mathematics between beauty and truth. The Greeks believed there to be three ingredients to beauty: symmetry, proportion and harmony. The Golden Ratio is 1:1.618. By understanding the underlying theories behind what makes us beautiful and attractive, PHI or The Golden Ratios, it makes it possible to plan treatments working towards this goal of Beautiphication. The new EA Beauty Workbook will help you determine your goals and wishes. Then, a series of photos and measurements will be taken including both 2D and 3D photos. The Vectra 3D photography system enables assessment at 45 and 90 degree angles as well as a thorough assessment of the skin colour and possible volume loss. Then, using the PHI callipers, 8 measurements will be taken to show natural beauty and/or deficits. Laxity, pigmentation, texture, and hydration will also be evaluated so that proper skin treatments and homecare are accounted for. Our goal is to design a treatment plan that satisfies! Information on beauty and wellness is abound and can often be quite misleading. Hope in a jar, facelift by needle, magic wands to erase this and that! Our clients deserve the attention required to ensure that they get the best results possible. It requires a trusting environment where you feel like you have been properly educated on the treatment options. It requires collaboration to ensure that the treatment plan suits your lifestyle and your budget. Most of us want to feel younger, slimmer, and sexier. We want to feel more attractive and comfortable in our skin & bodies. The EA Beauty consultation simplifies the process by presenting the options into smaller, more attainable goals. In today’s filtered world, it’s easy to get caught up in perfection. At EA, we believe you are already beautiful. Our objective is to help you see it too. Enter your name and email address below to access the EA Beauty Workbook. Yes! I want to be the first to hear the latest news from External Affairs. Our goal is to highlight your naturally beautiful features and help you to feel more gorgeous. Since the aesthetic industry has become mainstream on social media platforms, posting results which may or may not benefit the viewer, we decided that we needed to provide a better system for communication between clients and providers of their service. Whether you are new to EA or have been a long term valued VIP client, we are excited to offer you the EA Beauty consultation. By understanding the underlying theories behind what makes us beautiful and attractive, PHI or The Golden Ratios, it makes it possible to plan treatments working towards this goal of Beautiphication. Information on beauty and wellness is abound and can often be quite misleading. Hope in a jar, facelift by needle, magic wands to erase this and that! Our clients deserve the attention required to ensure that they get the best results possible. It requires a trusting environment where you feel like you have been properly educated on the treatment options. It requires collaboration to ensure that the treatment plan suits your lifestyle and your budget.